Wow….is this weekend really the official start of summer?! Where has 2014 gone so far? I know I say this in every post, but I really can’t believe how fast the year is going. I’m in the middle of my 32nd week and I’m definitely feeling like I’m in the home stretch of the pregnancy. The carpal tunnel is getting worse and I’ve really had to cut back at work and the swelling and edema is setting in. My hands don’t feel like themselves and I look down at my legs and see huge cankles and swollen feet. We’ve wanted these precious babies for so long that I’m trying not to complain, but it’s hard when your body doesn’t feel like it’s own. 32 weeks 4 days, getting much bigger! Today I had my first non-stress test (NST) and will have one with the rest of my remaining OB appointments. I was hooked to fetal heart monitors and the doctor is looking for an acceleration of heart rate twice in twenty minutes to indicate that the babies are doing well. Well, the little girls weren’t being so cooperative today, they were being “sleepy”, so I had to be hooked up two different times to get the desired reading. The nurse used a buzzer like apparatus to jolt the babies into the acceleration, it was amazing how much that buzz woke them up! The other mamas having NSTs with singletons seemed to have had loud, clear heart beat sounds and mine were definitely harder to distinguish. Since the most important things in life right now are keeping the babies in for as long as possible and working as long as I can, Hubby is really emphasizing that I take it easy and cut back on household stuff, etc as much as possible (Hubby has even curled my hair twice for me!). Therefore, I haven’t been in the kitchen cooking as much as I’d like. But, I had book club this past weekend and was really craving carrot cake. The recipe below is from one of my friends from dental school and it’s a “can’t go wrong” recipe that always turns out as long as you follow the suggestions. Hope you enjoy this easy and yummy recipe! Happy Start of Summer! This looks fantastic and you look adorable! Best of luck in the home stretch. So so so so so beyond happy for you Nikki!! 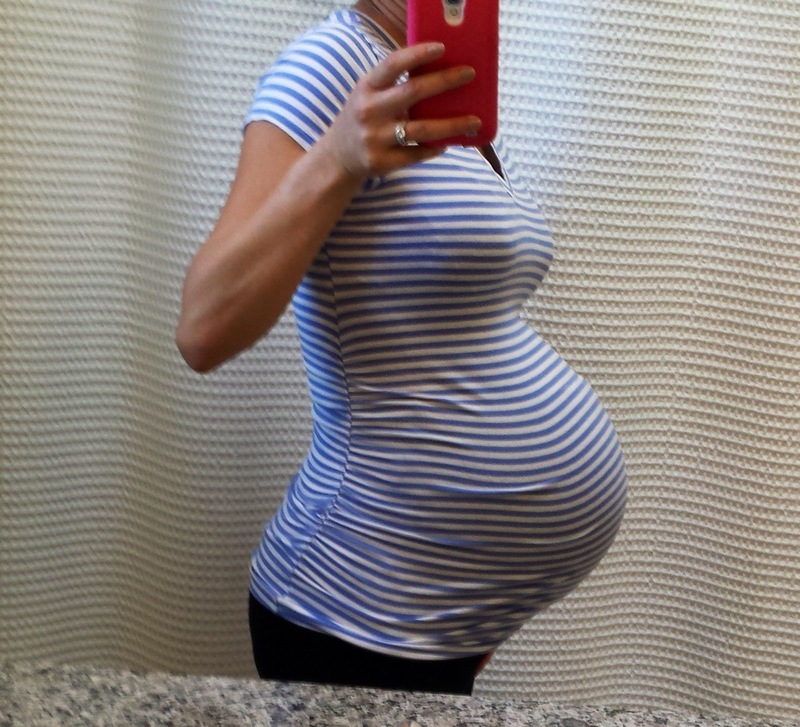 I’ve been away for awhile – seems I’ve missed a bunch, including the beach ball….er umm twins in your belly getting bigger! Lol, 😉 hang in there you’re almost there!!! Look at your gorgeous babies belly!!! I love that your hubby curled your hair for you, lol! Enjoy the last weeks of pregnancy – time flies! 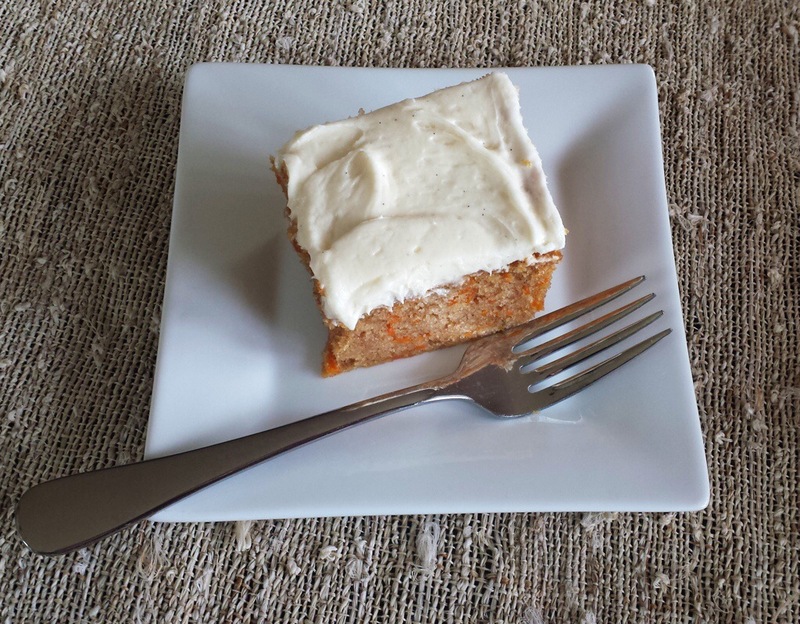 This carrot cake looks delish! Thanks for sharing! 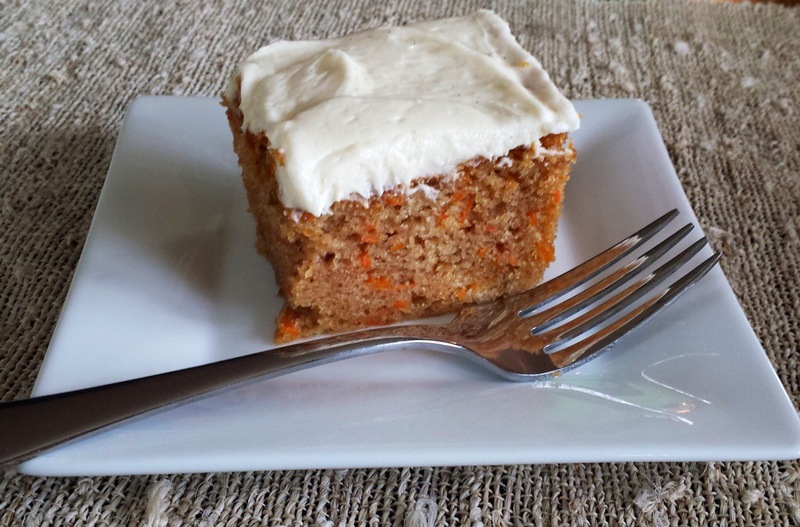 I have been looking for a good carrot cake recipe. Your cake looks delicious, can’t wait to try! I can imagine that the carpel tunnel is draining especially having to use your hands a lot for work. It looks like you are doing an amazing job of growing those babies. You’re almost there :-)! I swear by this recipe, it’s “no fail” and really tasty! Yes, hoping the last few weeks of work will be manageable! Your search may be over, this is a great recipe! Eeeek! Look at your precious belly! So amazing! You’re almost there… home stretch! Oof – good luck with the carpal tunnel. I hope yours resolves as soon as the pregnancy is done just like mine did. Your belly is ridiculously adorable! Thank you, I really hope it goes away right after pregnancy. I want to be able to comfortably hold the babies, etc. You look fantastic lady! You are all belly. I’m jealous. I’m pregnant all over!!! Thank you, I’m sure you look fantastic. Hope all is well for you! You look amazing!!! I am so excited for you guys. Just a few more weeks! Your nursery is absolutely beautiful. And your cake…YUM! I love carrot cake. I am going to have to try your recipe. Thank you Danielle. It’s the home stretch now, hoping to make it to at least 36 weeks. I’ve been thinking a lot about you. Hope you are doing okay, sending prayers. Try the recipe, it’s easy and yummy!